Women trying on shoes, 1930. Image via State Library of New South Wales. I need to buy wintery everyday shoes. I thought about oxfords but they are too popular around here (São Paulo). I dont like moccasins, I’m feeling too old for my Chuck Taylors, and flats are a little boring and too girly. Are there any options left??? I have to admit I was thrown for a loop upon reading your first line! I was going to confess my jealousy over how forward-thinking you were, as I can never seem to prepare too much for the next season until it is upon me…but then I realized you were in Brazil and in the same boat I usually find myself in. So let’s get to work and get you ready before the temperatures drop in the Southern Hemisphere. I love white sneakers, especially canvas ones. I don’t like them too sparkly white, as I think they’re much better with a “beat to hell” look. 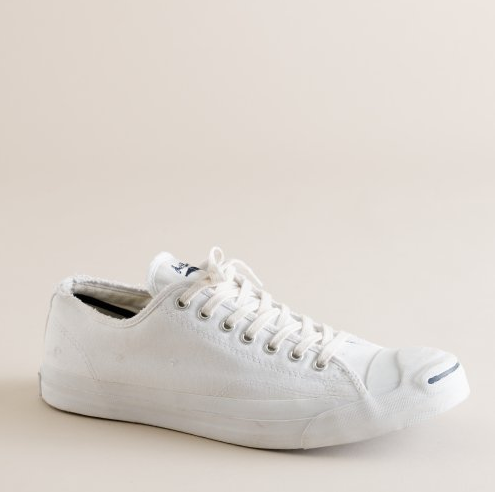 Hands down my favorite canvas sneaker is the classic Jack Purcell (shown above). Since you mentioned that you felt “too old” for your Chuck Taylors (which is impossible, believe me! ), perhaps the Purcells will feel a little more grown-up. I also like classic white Keds, basic Supergas,Tretorn T56s, Adidas Lavers with the green sole, white on white checkerboard slip-on Vans. Perhaps you are looking for something a bit sturdier for the winter months? 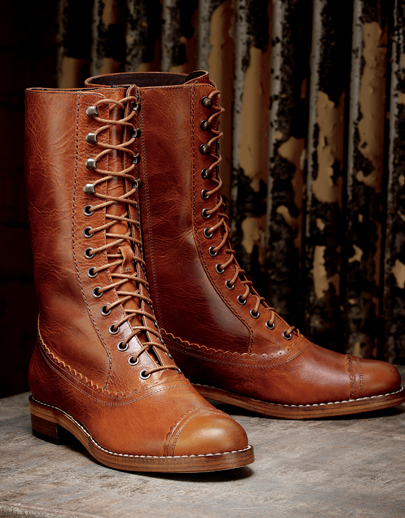 I love the color and detail of the Wolverine Gibson Mattie boots (shown above). I also like the classic smooth Doc Martens in 14-eye, and the James Wingtip Lace Up and the Paige Tall Riding Boot, both by Frye. Speaking of riding boots, if your budget is pretty flexible check out these by Ferragamo and these by Ralph Lauren Collection. If you care to enter dreamland, feast your eyes on these beauties by Hermes. Another idea might be men’s desert boots or chukka boots — try Clarks or J. Crew. They both also make a “women’s” version, which involves taking this naturally handsome boot and sticking it on a wedge. Avoid at all costs. I know you mentioned that you didn’t want oxfords, but I was wondering if you had considered a pair of slippers like these beauties shown above by Stubbs & Wootton? The slipper can be a bit tongue-in-cheek for some, but if you’re not afraid of that, then you’ve got a whole world to consider! Ralph Lauren has their horses, Brooks Brothers will lend you their monogram, Del Toro will make you a pair with your own, and the aforementioned Stubbs & Wootton has plenty of designs worth perusal. I especially like the “tassels” on these linen slippers. i will email you a pic of the shoes i got (the purchase happened before i read this post). 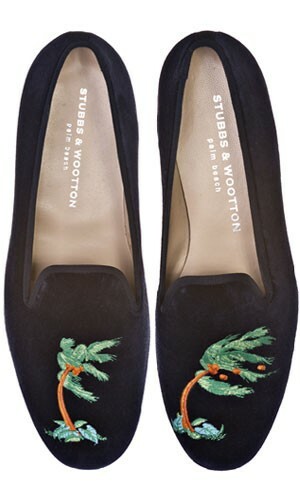 but i might still get one of those slippers (loving the skull and bones pair from stubbs and wootton)! I agree, one is never too old for a beat up pair of chucks! You are currently reading Ask Me Anything: Shoes for a São Paulo Winter at Quite Continental.